I was clicking through all my pictures and almost clicked past it. Another blurry picture, I thought. I’m an expert at the blurry snapshot. In the days of film cameras, that talent was especially frustrating. I’d get back a whole roll of nothing but blur — and have to pay for it. These are the kind of pictures I often take. I think this was supposed to be the reflection of the moon in a puddle.  It was sandwiched in with a whole bunch of other moon pictures. I remember that evening walk, seeing the moon’s reflection in a roadside puddle, taking the picture, knowing that I didn’t have enough light. 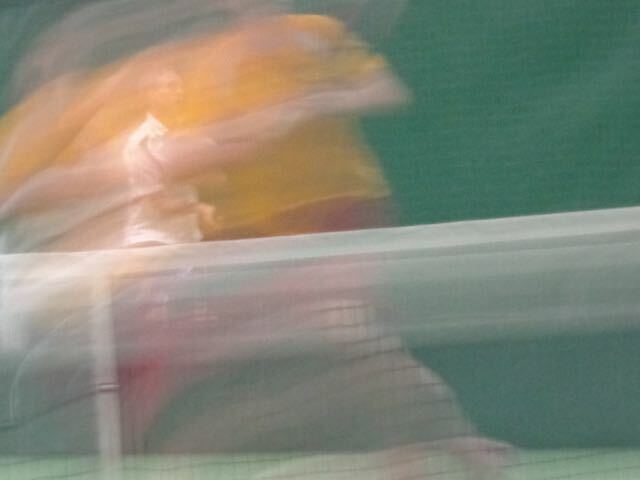 Karl is playing tennis somewhere in this photo. In the days of film cameras, I would have thought that I somehow double-exposed, but I don’t think I can do that with my phone. I don’t know how it happened. At least in this blurry shot, there’s a sense of what the picture was all about. 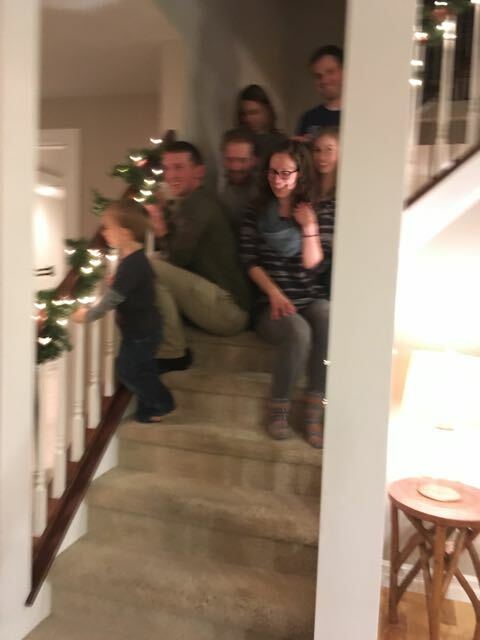 We were setting up the family photo at Christmas, arranging people on the stairs, and I snapped this. I love to catch my children laughing, and they were laughing at something here. Something blurry. This is the one I almost clicked past, but I paused and looked at it. It was a little ironic, because that’s what I did the day I saw it. I remembered the day I had taken a walk in town. I parked in front of the library and before I started out, I prayed a little prayer Andrew Peterson had talked about once at Hutchmoot — Lord, show me something cool. Because I walk the same route over and over, even though it’s Cooperstown and beautiful, I start missing the beauty and wonder of it. 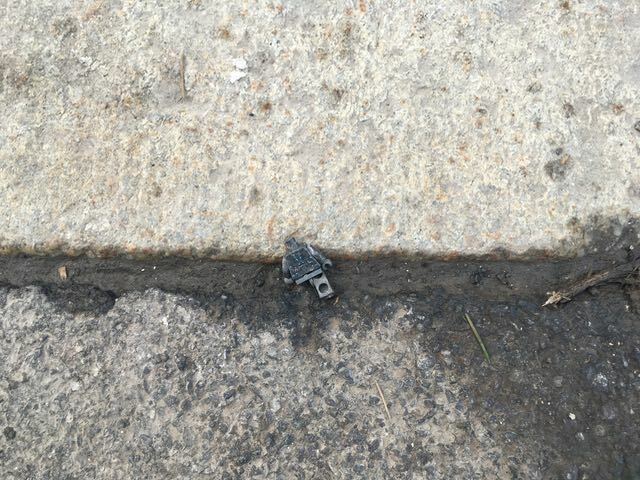 Lord, show me something cool — and half a block later, there was this decapitated, one-legged Lego man, half on the curb, half in the street. I stepped over it, barely noticing, and took about three more steps. Did I just miss something cool? I walked back, took the not-blurry picture, and continued my walk, turning that little dead Lego man over and over in my mind. Should I have scooped him up and thrown him away? Should I have scooped him up and found a head for him? Should I have left him there for the street cleaner or another passerby, maybe even a child? I did leave him there — but he didn’t leave me. He reminded me of the hurting world we live in — a world of poverty, not just of material goods, but of the soul. Where we fail to think of the other person. Where we hoard all the things with which we should be generous. Where we forget whence we came. Cool things come in unexpected shapes and sizes and places. A broken toy in the gutter can become a whole sermon. That toy can certainly mean a lot! I’ve done that- usually while carrying my camera while it’s on and clicking it. Usually it comes across as something odd. Sometimes it looks artistic.